Rye Playland, one of the only amusement parks in the U.S. owned by a municipality, is hemorrhaging nearly $5 million a year. Westchester County has been unable to pull the park out of its tailspin. RYE, N.Y.—When Sandhya Subbarao moved here 15 years ago, she says families heading to the Playland amusement park would clog the highway with traffic. Now, Rye Playland attracts just half its attendance during its heyday, and Ms. Subbarao leads one of several groups that are competing to take over and rejuvenate the 83-year-old park. The Playland, one of the only amusement parks in the U.S. owned by a municipality, is hemorrhaging nearly $5 million a year. Some $3.5 million of that annual operating loss goes to service $32 million in debt. The county has been unable to pull the park out of its tailspin. A string of accidents, including four deaths, between 2004 and 2007 scared away visitors. Attendance took another drop in 2009 after the county started charging $30 admission. Last year's attendance of 500,000 was down from 1 million in 2005. Last year, Westchester County Executive Rob Astorino solicited a request for proposals to "reinvent the historic amusement park." The request covers about 100 acres, including Playland's amusement park and ice skating rink. "An amusement park isn't an essential service for a government to own and operate, at a time when there's tremendous strain on funds," he says. 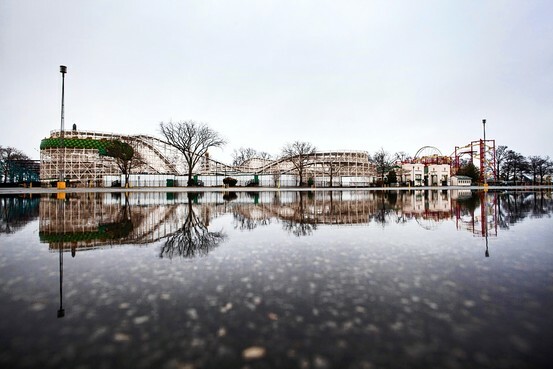 The iconic amusement park, which opened in 1928 as one of the country's first planned amusement parks, covers 289 acres and includes a number of buildings and rides designated as National Historic Landmarks. Eleven groups have come back with proposals to take over the park or part of it. A county-appointed committee starts evaluating proposals next month. Most come from amusement park and fair operators. That's not true of Ms. Subbarao's group, Sustainable Playland, a nonprofit backed by Goldman Sachs and UBS financiers who live in the area. Ms. Subbarao's motivation: She says she didn't want to see her local park turned into a over-the-top hotel or casino. She and her husband Dhruv Narain, founder of Goldman Sachs' Special Situations Group, as well as Peter Rukeyser, a managing director at UBS Private Wealth Management, raised $150,000 from private philanthropists for their proposal. They tapped Doug McKean, a Rye architect known for his work at Grand Central Terminal in New York City, to come up with a new plan. Mr. McKean had written his Master's thesis on the reinvention of Playland in 1979. Sustainable Playland proposes continuing to operate the amusement park while spending $35 million to add year-around draws like ball fields and restaurants. "At the end of the day, we're county residents and we're the ones who suffer and pay taxes on the amusement park's losses," Ms. Subbarao says. The bulk of the applications are from veteran amusement park operators, such as Central Amusement International of Boonton, N.J., which won a New York City bid to lease and develope 6.2 acres last year for Coney Island's Luna Park. Central Amusement said it plans to lease the Rye Playland land from the county, maintain its historic rides and update the park over time. Another proposal is for a $15 million to $20 million sports complex at the site. A partnership of Air Structures American Technologies Inc. and Stonehill Group propose to build a 6.5-acre air-filled dome, similar to practice facilities used by the New York Giants. The group estimates it could generate $8.5 million in annual revenue in addition to the amusement park, which produced $12.2 million in revenue last year. "Everyone who grew up in Westchester remembers holding mom and dad's hand and going up to Playland so I don't like to see it suffer," says Donato Fraioli of the partnership. "But recreation for kids and families is changing and we have to adapt."